Just think about what our mouths would look like (let alone smell like) if we didn't brush our teeth regularly. Well, you don't have to imagine, just look in your pet's mouth! 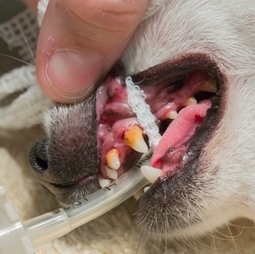 Unless you're extremely motivated, you probably don't brush your pet's teeth often, if ever. It's important to realize that dental disease isn't limited to the mouth--the longer bacteria lingers on your pet's teeth, the more likely these infections are to spread to other parts of the body. This can potentially cause problems in the heart, liver and kidneys. Most pets would greatly benefit from a plan for oral health including routine brushing and periodic cleanings by our staff. Pets are placed under general anesthesia and receive the same ultrasonic scaling and polishing that we humans receive from our dentists.